My daughter and I were on a hunt for an idea for a Halloween costume this year. 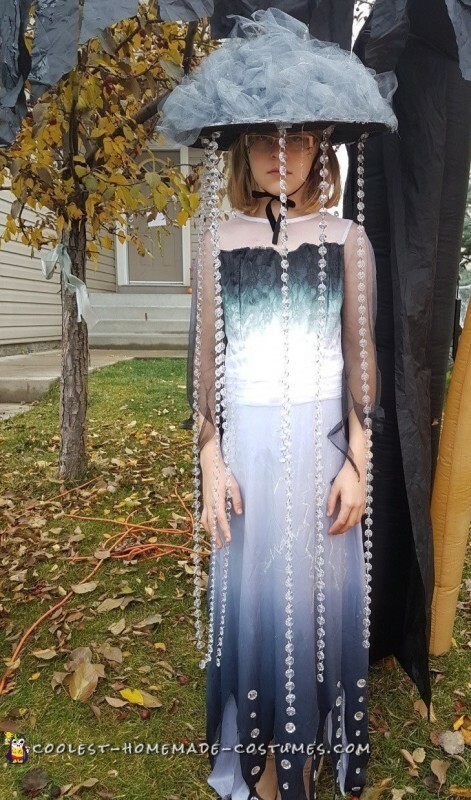 We looked on Pinterest and saw a few ideas that inspired us to make this rainstorm costume, aka our “Rainstorm Princess”. Our first step was to get a dress for the base of the rainstorm costume. 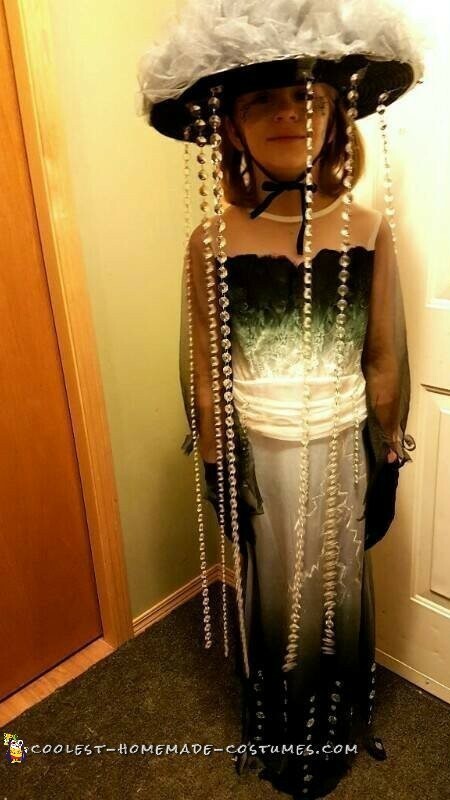 I found one online second hand that was originally a Bride of Frankenstein costume. We decided with the black/grey and white colors, it would be a good representation of a storm cloud and the gloomy colors of rain clouds and a grey sky! I found the straw beach hat at our local thrift store, and ordered the crystal strung beads and grey tulle online. After I had all the supplies, I cut out a base from heavy cardstock type paper to put on top of the beach hat in order to give it more strength, and painted it sliver. I hot glued it on top of the hat with a hole through the middle to place over top, (after stringing all the stands of crystal on to the hat from underneath.) The next thing I did was to wrap the tulle all around the hat to create the rain cloud and glued that on also with the hot glue gun. I hand painted the lightening bolts onto her dress with fabric paint and glitter. I also glued rhinestones onto the bottom of the dress, and strung some additional beads to the bodice of the dress too. It was quite a lot of work, over 7 hours (not including all the time spent researching where to buy/collect everything we would need) but it was fun! I think my daughter was quite proud of the final outcome! Because I am just submitting today and it is Halloween, I don’t know if I won any local contests. But there doesn’t seem to be very many in my city this year for some reason. I have had a lot of facebook likes and comments!